For most sufferers, symptoms tend to wax and wane, usually worsening after a trigger event such as overuse, or from walking barefoot or without their prescribed orthotics for anything more than a mid-night pad over to the bathroom. When that happens there are a variety of conservative remedies available. Icing, stretching, self-massage (porcupine balls are among my favorite inexpensive devices for breaking up scar tissue to help relieve the pain), along with basic rest are all effective at relieving pain. If things don’t get better quickly a visit to the massage therapist, physical therapist, chiropractor or foot specialist is usually in order –but this involves delay in getting an appointment, time for the visit and some expense. More extreme cases may require hydrocortisone injections or surgery, both of which can have serious long-term repercussions, and are not to be entered into lightly. The conundrum many fasciitis sufferers face daily is that too much rest (including sedentary inactivity, like spending too many hours in front of the computer or watching TV) can atrophy the foot muscles just enough so that upon the next strenuous event – sometimes simply standing after a prolonged period of sitting – deep pain is triggered once again. Yet without activity, how can one go about strengthening their foot muscles? The exercises your physical therapist showed you to do, like scrunching up a towel with your toes, will only get you so far. It becomes a vicious cycle for many, especially those whose plantar fasciitis condition is tied to an overweight or obesity condition. Throw in Type II diabetes and you get a poor health trifecta. These people find it the hardest to perform good aerobic, fat-burning exercise without reinjuring their foot – and setting them right back on their heels, so to speak, yet again. I used to avoid long periods of standing, per my doctors’ orders. 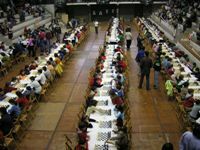 Then, one day, I was tapped to be a judge at my kid’s chess tournament, which basically entailed being on my feet for 9 hours, on a hard gymnasium floor with no carpeted areas. I walked about only in short spurts to record scores, approve restroom hiatuses, and hush talkative contestants. By the end of the day I thought I was literally going to die of foot pain. I spent the evening icing and massaging my feet, and swore off chess tournament judging forever. Shockingly I woke up the next day with less plantar pain than I’d had in months. Something about standing all day appeared to have strengthened my foot muscles – despite the contemporaneous pain – so that after a day of rest I was actually eager to take a hike. I ended up walking 6 miles that day! Could it be a case of “no pain, no gain”? Could it be that all I really needed to break a long-enduring heightened condition of plantar fasciitis was a torturously long and painful standing session? When I inquired with several of the health care professionals who treat my plantar condition, none had ever heard of this phenomenon and all were cautious about encouraging me to do something like that again. So, of course, I signed up to judge another chess tournament… and another, and another. Each time the experience was similar, only the 9 hour standing sessions got less and less painful, and I found myself more and more energized simply from having less pain. The medical literature doesn’t say anything about this potential method of treatment – frankly it just hasn’t been studied. Anyone who has ever had to work a trade show booth, standing on their feet all day, knows how much better it feels to walk the show than to work the booth. When we walk, our calf muscles pump blood back up legs rather than letting it pool in our lower legs (one reason standing too much can lead to varicose veins). More importantly, even gentle walking (1 to 2 mph is the typical pace on a treadmill desk) will tighten ligaments, lubricate joints, and in general help our bodies stay limber and ready for action. Standing, not as much. Sitting for longer than an hour, the reverse. 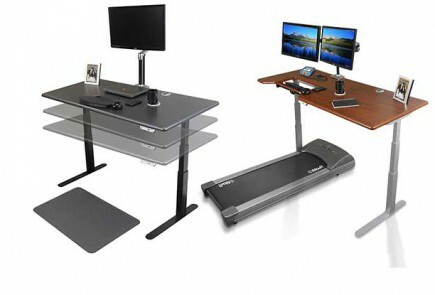 For plantar fasciitis sufferers, and particularly for those of us who are challenged by being overweight or obese, a treadmill desk does more than burn some extra calories. Because of our double-whammy condition, getting good solid sessions of fat-burning aerobic exercise can be tough either because we lack the stamina or we injure too quickly, if not both. This is where I’ve personally found the treadmill desk to be a godsend. By using it two to four hours per day I’ve been able to keep my feet, ankles, knees, and hips in good condition with minimal impact, which has allowed me to graduate to extensive workouts at the gym and/or hikes in the woods every day of the week with far less injury or fatigue than I used to experience before. If you do start treadmill desking be sure to read our comprehensive advice on how to safely and efficiently ramp up this new activity so you get the most of your new equipment and avoid common ergonomic pitfalls that can set you back. If you don’t have the space for a treadmill desk then by all means start with a standing desk – it’ll keep you out of your chair that many more hours per day, and that’s step one.